one of the main dishes that we served for mother's day brunch this past weekend was a strata. a strata is basically a breakfast casserole. the great thing about this dish is that all of the prep work is done the night before. that means all that you have to do is just wake up, preheat your oven, and let the strata bake. the base of this strata is bread. we used a loaf of crusty italian bread, but french bread would work great too. 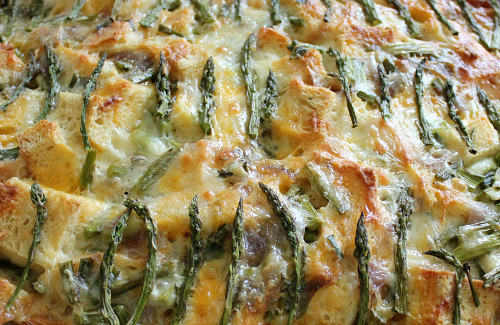 since asparagus is in season, we loaded this strata with fresh asparagus. we included scallions and red onion for some extra flavor too. 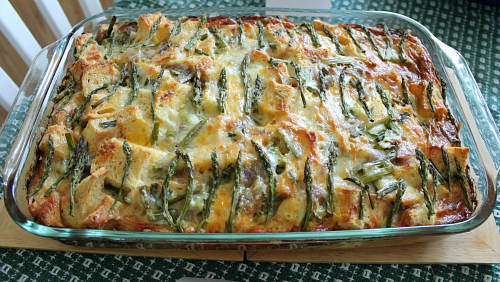 there are also three different types of cheese in this strata which really make it amazing. this strata is so versatile because you could substitute just about any type of vegetables and cheese in this casserole . . . but, i have to tell you that the combination of the asparagus, scallions, cheddar, gruyere, and parmesan is really great! this strata is super yummy and super impressive, yet it is so easy to make. it's so nice to have easy dishes like this when you are entertaining a group of people (or when you want to wake up to a really nice breakfast on a weekend morning)! melt the butter in a large skillet over medium heat. cook the onion in the melted butter until translucent (about 5 minutes). stir in the chopped asparagus (remember to set the asparagus tips aside for later), the chopped scallions, and the pepper. cook until the vegetables are soft (about 10 minutes). place half of the bread cubes in the bottom of a buttered a 9x13 inch glass baking dish. spread half of the cooked vegetable mixture over the bread cubes, then spread half of each cheese over the vegetables. create a second layer with the remaining bread cubes, vegetables, and cheese, then arrange the asparagus tips on the top. whisk together the eggs, milk, and mustard. pour the egg mixture evenly over the strata. cover with plastic wrap and chill in the refrigerator for at least 8 hours, or over night. remove from the refrigerator and allow the strata to sit on the counter for 30 minutes to come to room temperature. meanwhile, preheat your oven to 350 degrees F. bake uncovered for 50-60 minutes, or until the are no visible signs of liquid egg mixture. remove from the oven. allow the strata to sit for several minutes to set up before cutting. serve hot.